The perfume I have reviewed for this post is a vintage Caron extrait of Acaciosa from an unknown, most definitely better era. The jasmine here is prominent, buttery in the presence of its peers. A galaxy better than the stuff available today (says Luca Turin and Tania Sanchez). The house Caron calls to mind luxury in the fragrant medium, perhaps the first haute perfume house of its kind. Complex blends, enigmatic mixtures, fine ingredients. Self-defined as an avant-garde house, Caron effortlessly combines both a refined timelessness and a level of panache when keeping with the times in line with art and fashion. The works, especially the vintage and older ones, have a certain aplomb in their projection; simply unapologetic. Caron has shaped the perfume landscape, especially prominent during the 20th century. Tabac Blond in 1919, Acaciosa from 1924, the calming Pour Un Homme (1934), and the tart and arid masculine Yatagan in 1978. These perfumes challenged conventions, and augmented norms to reflect a new time period; a new era of decadence. Acaciosa in particular heralded a new mindset with exceptional savoir-faire, a pinnacle period of perfumery emphasising balance and great floral compositions with extravagant radiance. 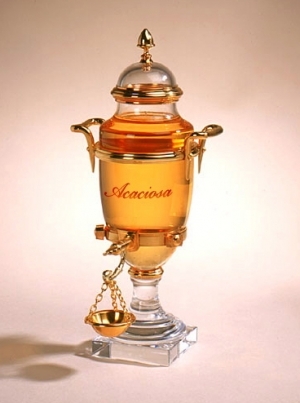 A scorching perfume, Acaciosa is a proud creature, blended venerably to perfection. Acaciosa is a rather androgynous perfume, which surprisingly calls to mind the pineapple and jasmine flecks of Aventus by Creed (it pains me to type that, but it’s true) and the brilliant lily-of-the-valley clean freshness of Diorissimo – boasting its high volume radiance with an acidulous quality when met up close. Together Acaciosa is a floral made tropical, a bouquet of rich florals laced with pineapple. The jasmine here is rich, initially dirty, and obviously lavish in the composition. The combination of orange blossom, vanilla, and rose recalls the sweet marshmallow accord of Guerlain’s Habit Rouge, especially the prominent florals during the mid stage of Habit Rouge. Ylang-ylang and maguet are bolstered with tropical fruit, namely pineapple trickled with a light berry accord; shaped precisely with sandalwood and an undercurrent of vanilla. What intrigues me is the opening of Acaciosa, shimmering in the presence of citrus and a mild touch of aldehydes. I’ve determined this is largely a paradigm for 1920s florals and feminine fragrances, with the likes of early Chanel and Guerlain works especially enjoying the overdosing of aldehydes. What these works share is great drama; stunning and gradual progressions that are both seamless yet totally evident on the skin. At stages Acaciosa is buttery, much like Chanel’s Bois Des Iles with a lesser amount of peachy aldehydes in the background. As it dries, Acaciosa fleets like vintage powders with their trademark syrupy and cloudy sweetness; eternally warmed with a chypric-moss base and amber. In the end, the florals are sweeter, honied pleasantly behind the gauzy powder and musk accord against sandalwood. Acaciosa smells of a foreign jasmine perfume; unlike anything else available today. This is a pineapple for grownups, which is something I find hard to do. It gives certain body without losing its strength, and it has this prominent approachable buzz on the nose. The pineapple here is caramelised, smoked to reveal smooth and malted woody facets. Bravo. Alternatives: Aventus by Creed; Diorissimo by Dior; Habit Rouge by Guerlain; and Bois Des Iles by Chanel. A pleasant wear. Acaciosa features a teetering quality leaning towards dated, yet the sweetness delivered by the pineapple maintains this fragrance’s interesting, neo-modern qualities. This entry was posted in Caron and tagged Acaciosa, Caron, Fragrance, fragrance review, Perfume, Review. Bookmark the permalink.